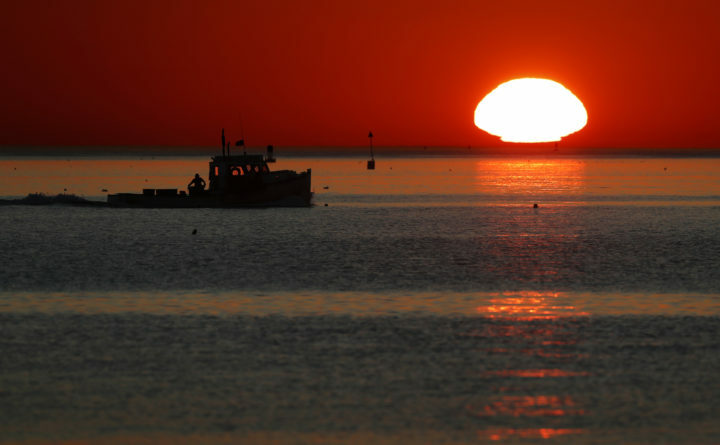 In this Sept. 13, 2017, file photo, a lobster fishing boat heads out to sea at sunrise off shore from Portland, Maine. New 2018 data indicates that the Gulf of Maine, one of the fastest warming bodies of water in the world, is in the midst of an all-time hot stretch. PORTLAND, Maine — The waters off New England are already warming faster than most of the world’s oceans, and they are nearing the end of one of the hottest summers in their history. That is the takeaway from an analysis of summer sea surface temperatures in the Gulf of Maine by a marine scientist with the Gulf of Maine Research Institute in Portland. The average sea surface temperature in the gulf was nearly 5 degrees Fahrenheit above the long-term average during one 10-day stretch in August, said the scientist, Andy Pershing, who released the work Thursday. The day of Aug. 8 of this year was the second warmest day in recorded history in the gulf, and there were other sustained stretches this summer that were a few degrees higher than the average from 1982 to 2011, Pershing said. He characterized this year as “especially warm” even for a body of water that he and other scientists previously identified as warming faster than 99 percent of the global ocean. “We’re seeing really unusual conditions all over the planet this year. Wildfires and heat waves. Unusual conditions. The Gulf of Maine is part of that story,” Pershing said. The Gulf of Maine is a body of water that resembles a dent in the coastal Northeast, and it touches Maine, New Hampshire, Massachusetts and Atlantic Canada. It’s the nerve center of the U.S. lobster fishing industry, an important feeding ground for rare North Atlantic right whales and a piece of ocean that has attracted much attention in recent years because of its rapid warming. The gulf warmed at a rate of about 0.1 degrees Fahrenheit over the past 30 years, which is more than three times the global average, Pershing said. That rate has jumped to more than seven times the global average in the last 15 years, he said. The warming of the gulf is happening at a time when the center of the U.S. lobster population appears to be tracking northward. America’s lobster catch is still high, but rising temperatures threaten to “continue to disrupt the marine ecosystem in this region,” said John Bruno, a marine ecologist with the University of North Carolina who was not involved in Pershing’s work. The gulf has seen temperatures above the 90th percentile for more than five consecutive days this year, which constitutes a “marine heatwave,” Pershing said. It has set 10 daily temperature records this summer after setting 18 over the winter, he said. The warming is bad news for the rare right whales because it impacts the availability of tiny organisms they eat, said Jeffrey Runge, a research scientist with Gulf of Maine Research Institute and the University of Maine. It’s symptomatic of warming oceans all over the world, Runge said.